Cookie by Gotz is a large soft bodied baby doll that's best suited to children age 5+ due to her size and weight. Cookie has brown sleepy or closing eyes when she is laid down to sleep. Her vinyl and face paint is beautiful, fresh, natural and lively. 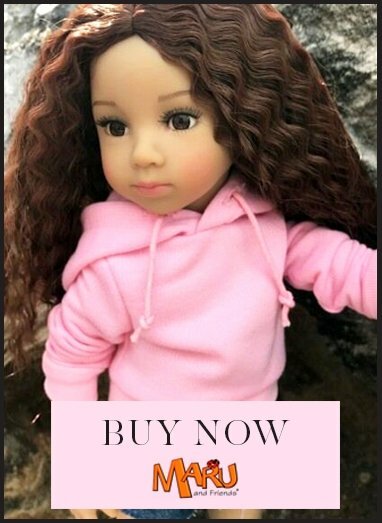 She could equally be a boy doll as these dolls are not anatomically correct. Read more below. She has brown sleepy or closing eyes when she is laid down to sleep. Her vinyl and face paint is beautiful, fresh, natural and lively. She could equally be a boy doll as these dolls are not anatomically correct. Cookie is big and cuddly, like a real baby, and she can even wear real baby clothes at this size! After Cookie has played all day with her mummy she then falls asleep in her bed, with her favourite teddy bear and cuddly blanket, all tired out. Little Cookie wears a fun, spotted babygrow with a blue pointed hat. The Cookie body is soft as she is filled with polyester fibre in her body and weighted with pellets in her bottom so that she feels a realistic baby weight. She can sit up due to the pellets and movable joints. Her limbs are approximately one third fabric, the rest being soft vinyl. She has disc joints at the hips and shoulders which allow her limbs to be moved. Cookie wears a blue spotted romper suit, which is how she gets her " Blue Spots" name. Additional Gotz clothing to fit Cookie is here: Gotz Cookie clothing.